After his stunning win at Valencia in the final race of the season on Sunday it was Jorge Lorenzo who topped the timesheet again on Monday in the first day of 2014 ‘pre-season’ testing. Lap times of course do not mean a great deal at this stage, with some riders swapping machinery, many tweaking set-up and some joining new teams, but Lorenzo set the standards again – with a 1’31.257 late in the day. That lap was quicker than anyone went in Sunday’s race and came on the 2013 YZR-M1, although Lorenzo also has a 2014 development Yamaha available this week. On the other side of the Yamaha Factory Racing box Valentino Rossi spent the day working with new Crew Chief Silvano Galbusera. The Doctor’s best time of the day was just 0.093s off Lorenzo’s best, also coming on his 2013 bike, though he too is already using the 2014 development M1. Repsol Honda’s new World Champion Marc Marquez and his colleague Dani Pedrosa were both at the circuit but did not test on Monday – though they are expected on track on Tuesday as the battle to stay ahead of Yamaha continues. Stefan Bradl was the fastest Honda rider on track on Monday, using his RC213V from this season to set the third best time of the day – 0.5s off Lorenzo’s pace. New Ducati recruit Cal Crutchlow has taken Italian Crew Chief Daniele Romagnoli with him from Tech 3 to the Italian factory Ducati and the pair were working alongside new Ducati Corse General Manager Gigi Dall’Igna for the first time on Monday. Crutchlow matched Ducati’s Sunday race pace, and was sixth overall just over 0.1s (check) behind new Ducati teammate Andrea Dovizioso who was fifth best. Dovizioso lapped in a similar pace to fourth fastest rider of the day, Andrea Iannone on the Pramac Racing Ducati. Ducati Test Team rider Michele Pirro was 0.6s behind Crutchlow in seventh, just ahead of Yonny Hernandez – who was confirmed today to remain as Iannone’s teammate in the Pramac Racing Team permanently during the 2014 season. Moto2 World Champion Pol Espargaro rode his first laps on his new Monster Yamaha Tech 3 MotoGP bike, in tenth spot on the timesheet, with a lap around two seconds off Lorenzo’s pace. His new teammate Bradley Smith sat things out and expects to get through all his test work for this week on Tuesday. The new Honda RCV1000R was used for the first time by the GO&FUN Honda Gresini team as Scott Redding also got his 2014 MotoGP preparations underway, the Englishman ending up 11th overall. Cristian Gabarrini from HRC got Redding's initial feedback on the new prototype, which the teams will adapt to over the winter. Hiroshi Aoyama officially joined the Power Electronics Aspar team on Monday, but with Aspar only having one of their new Hondas ready for today, Nicky Hayden will have to wait until Tuesday to ride it. 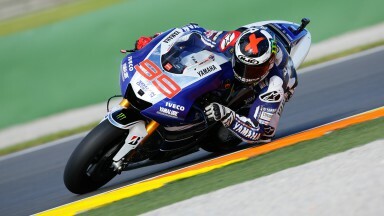 Aoyama was ninth best on the timesheet, 1.8s down on Lorenzo’s P1 pace. Mike di Meglio has not ridden since the Brno Moto2™ race due to serious injury, but he was back on track today testing with the Avintia Blusens team. Randy de Puniet should be testing with the PBM team on Tuesday as they look to confirm direction for next season, with the 2014-spec ART being prepared for the Frenchman on Monday. The testing action at the Ricardo Tormo circuit will continue on Tuesday and Wednesday (10am-5pm both days). Live video coverage will be available again through motogp.com on Tuesday (11am-2pm).